Tom Antion: Another Retreat Tomorrow! This is Tom Antion’s Great Internet Marketing Retreat Center where Mentees from all over the country attend his ButtCamp seminars and learn to become successful making money online! Another great retreat starts tomorrow and I look forward to seeing you here someday too! I have another retreat this week at my home in Virginia Beach, Va that we call the Great Internet Marketing Retreat Center, where people come from all over the world to study Internet marketing in the lap of luxury. This is the only retreat center of it’s kind in the world. How would you like to be a part of this unique expirience? To find out more information you can download this FREE 20 page, full color Brochure in a instant PDF format and find out all the things that you can learn by being a part of this program! Tom Antion: Look At This Offer! 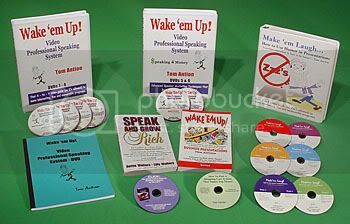 I have offered my Wake ‘Em Up Video Professional Speaking System on eBay! Times are tight right now so I thought I could save you a couple of bucks on this fantastic system. Click the link above to go directly to that page in my store. Learn to make $5500 or more per speech! I’m Tom Antion. When I say “square one,” I MEAN SQUARE ONE! When I started I had a website that received only 400 visitors in two years and I had no computer knowledge other than word processing. To this day I don’t have a tremendous amount of basic computer knowledge. The technical stuff doesn’t even interest me. . . . I like to write deposit slips, not programs. I do know where to “click” to make money and this E-book was designed to make it easy for you to click in the right place without all the trial and error I suffered through. The Craig Duswalt RockStar System For Success starts today in Valencia, CA. This does not mean that you should throw away any link trades you now participate in. Just don’t respond to any new ones unless they meet the guidelines in the audio file mentioned above. . . . And I can tell you that the guidelines won’t be met very often, so you can pretty much forget about trading links. Get More Great Internet Marketing Techniques! Tom is spending today hustling through airports and taking his shoes off for the security checkpoints to get to Valencia, CA. He is speaking this weekend at Craig Duswalts RockStar System For Success seminar in front of a sold out crowd. We wish Tom a safe and relaxing trip! Get Great Internet Marketing Training Here! Tom Antion: See Tom In Valencia! Get info on The RockStar System For Success!